"The Ethereals, emerging from the nether, will bring with them a new technology they call Transmogrification. They’re heading to the capital cities of Azeroth to set up shop and to offer adventurers a unique service - copying the appearance of one magical item onto another. They only ask for a modest gold donation to recoup their costs." From what we have been told, an item can be re-skinned into an older, maybe cooler looking, piece of equipment. Example: "Tier 12 to look like Tier 2"
"Placing an item into the Transmogrifier interface will offer a preview of how the item will appear once the change is applied. However, not all item pairings are compatible with Transmogrification. In general, only items that have stats can be used in the transmogrification process. You must also be able to wear both items when using this service. Ethereals don’t have much in the way of ethics, but allowing someone to appear as if they’re equipping unusable items crosses the line." Example: Plate to Plate; Mace to Mace; Staff to Staff; etc, etc. Wait! We can not modify Immolation Faceguard to Crown of Destruction? No. It is a safe assumption that the designers do not want cloth casters to appear as plate wearers or vice versa. This also includes set items such as "Warlock, " "Hunter, " "Mage, " and "Shaman." 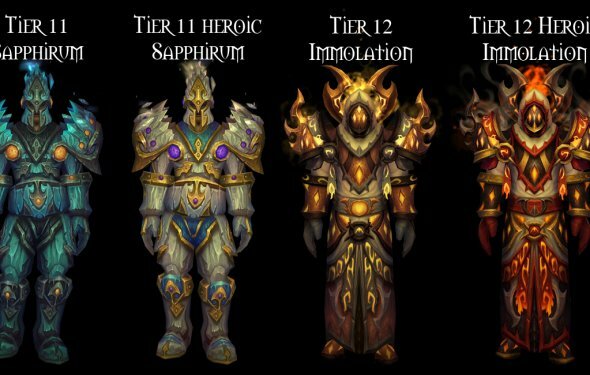 Example: As a Paladin we can not wear Death Knight armor sets, but we can find same model items to transmogrify to. That is why this thread is being created - after all. : Thunderfury, Blessed Blade of the Windseeker, Shadowmourne, or Sulfuras, Hand of Ragnaros will not be able to be transmogrified at initial launch. The complexity of these magical items currently surpass the knowledge held by the Ethereals. A Short Note: Tired of leveling in that old dusty Bind on Account gear? Well do not worry, BoA gear can be transmogrified! It is important to understand that transmogrified gear is character side only. You can not transmogrify your gear, mail it to an alt and look like you're in Tier 12 at level 10. But you are more than welcome to collect quest items, build an outfit, and transmogrify at your hearts content! A Short Note: Weapon art will be the only thing that is transmogrified. If you have a weapon with Power Torrent and transmogrify it to another weapon with, say crusader, the transmogrified weapon will show up with Power Torrent. Only uncommon, rare, or epic items may be transmogrified. There may be individual items that are excluded from being transmogrified on the basis that they were originally added to the game as absurdities. All ideas, armor sets, and unique weapons are welcome! Start bragging about your favorite armor configurations!